Ever wonder what a particular dream means or what your subconscious mind is trying to tell you through your dreams? 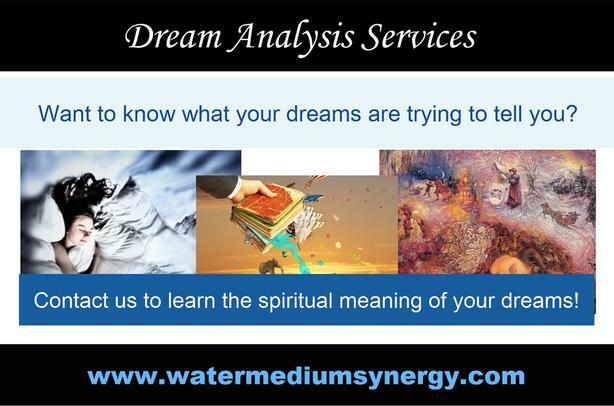 Book a Dream Analysis session with us at Water Medium Synergy and let us interpret your dream for you with incredibly accuracy and helpful insights on how to utilize your dream's key messages being sent by the Spiritual Realm. We offer over 2 decades of dream analysis expertise and our various 8-Clairs in each of our dream interpretation sessions. Readings are offered in person, by phone and by email. For more information about this service and mediumship services we offer including prices and how to book your confidential dream analysis session - please see our promotional flyers for our contact details and website.